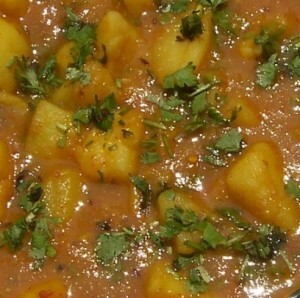 Aloo Gravy recipe by Sarahj at DesiRecipes.com. In one pan heat oil. Fry the onions and ones the onions are brown add the ginger /garlic paste and kalongi. Next at all the masala's. Then add cut potatoes, fry in the oil till the masala mixes well. Add the tomato puree and lemon squeeze. Then add two cups of water. Let it cook till the potatoes are tender. Serve with puree or naan. Excellent recipe and very easy to make. Great result too!